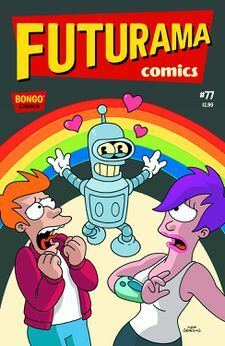 Characters on the cover: Fry, Bender and Leela. "New New New York" is the seventy-seventh comic issue, released on 18 November, 2015  in the US. Fry complains that New New York City seems to be changing overnight, and after pulling an all-nighter by drinking a can of hyper-caffeinated Slurm, he discovers an alien race called the Developers are actually changing the city for the better overnight – while the city sleeps! But is “better” really better? Not for Bender! As a child, the Professor is shown to have cloned dinosaurs that ended up roaming the streets of New New York. Leela is shown wearing a previously unseen Planet Express uniform when fixing the ship at the start of the comic. Scott the zombie appears to have a janitorial role at the Planet Express building. Coincidentally, Scruffy, the company's usual janitor, is said to be a zombie in "Law and Oracle". Sleazybucks is a reference to coffee store chain Starbucks. Bender's "Bendy" form is drawn in the same style as early Mickey Mouse, including white-gloved hands and two buttons on his torso. The pink pony on the pony petting zoo sign is very similar in style to Pinkie Pie from My Little Pony: Friendship Is Magic. Hermes: Fry! You know the office rules! Fry: Throw out all expired yogurt before it becomes sentient? Hermes: Zoidberg, draw up some commitment papers for Fry. Zoidberg: I'm way ahead of you! Hermes: [reading the papers] These don't say Fry's legally insane,  they say he's legally dead. Zoidberg: It's not the first time I've made that mistake! At least we don't have to dig him back up! ^ See also Insane in the Mainframe. This page was last edited on 5 December 2015, at 21:17.